The “Proof of Creation” does not have the legal effects of a design registration at the Trademark and Patent Offices and it is not intended to grant to the owner any exclusive right on its work. The only aim of the “Proof of Creation” is to help the designer to demonstrate the creation of his work at a given time. You are suggested to obtain registration of your commercially viable and valuable designs for real protection and control, according to the national Intellectual Property Laws and/or the International Conventions relating to Industrial Design since said registration is the most effective way to protect your rights. “Proof of Creation” cannot be applied to all designs (see “Threshold of Originality” concept) and we cannot guarantee that it can be considered a legal proof of paternity in all the Countries. A' Design Award and Competitions is not an official authority for design registration or copyright certification, it cannot be considered a substitute of a public notary or of any other official entity; A' Design Award and Competitions does not deliver exclusive rights on your works. 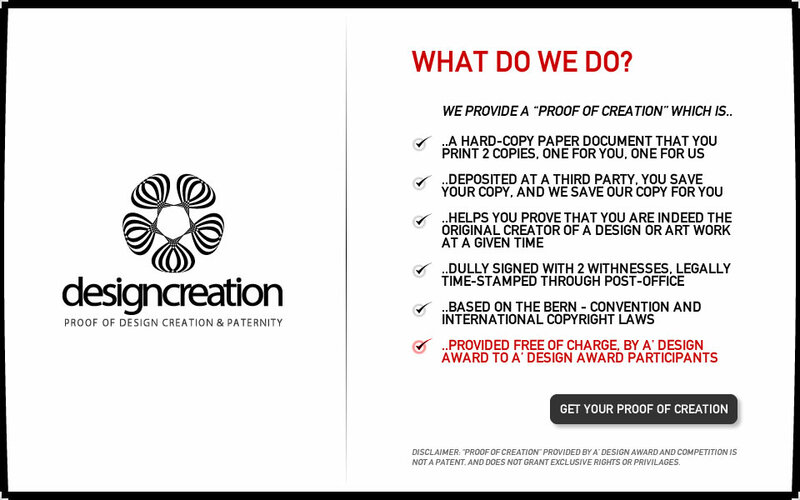 A' Design Award and Competitions is not liable for any damages or losses that may occur due to utilization of this service; it is not liable for damages or losses due to the destruction or theft of the “Proof of Creation” archived in its premises and, in general, for any damage caused to the “Proof of Creation”. If the “Proof of Creation” envelope is not properly sealed, it will lead to the disclosure of your design. According to the Intellectual Property Laws of some Countries, the disclosure of the industrial design before the filing date for its registration at the competent Patent and Trademark Office implies the invalidity of the registered design: in Italy, for example, a registered design is invalid if the design was made available to the public by the owner more than one year before its filing date. In any case, A' Design Award and Competitions do not accept any liability. A' Design Award and Competitions do not provide any warranty. This document has been prepared by OMC Design Studios S.R.L., and is copyrighted. For further Intellectual Property questions, please contact us.